A couple of weeks ago I was in Romania speaking at a marketing conference and conducting a workshop. The tireless Costin Radu is essentially the most connected man in Bucharest and he and his colleague Vlad perfected the art of hosting for myself, Neil Perkins and Duncan Southgate for a few days. 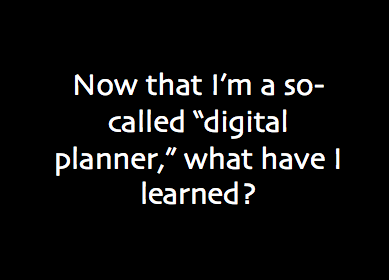 This is a hot topic as I’ve also seen a lot of people favorite the open-ended responses to the question I asked in last year’s survey articulating what digital planners see is the difference between their jobs and other planners on slideshare and a steady stream of traffic continues to land on this post I did on the subject a year ago. But I think it’s time for an update because some of the things I said before feel less true now that I’m in the trenches myself, plus the pace of change is rapid. What was true a year ago isn’t necessarily holding true today. So over the next several days I want to share my presentation a thought or two at a time and pick the thinking apart. Then I’ll post the whole thing on slideshare. I hope you’ll chime in and leave some comments. Matching luggage is dead. We need to make the case that the world is changing until every team member believes it. Then we can go about our business of making a lot of stuff that we think is cool and inviting. See what works. Do more of that. Burger King is the best example I’ve yet to come across that operates this way. 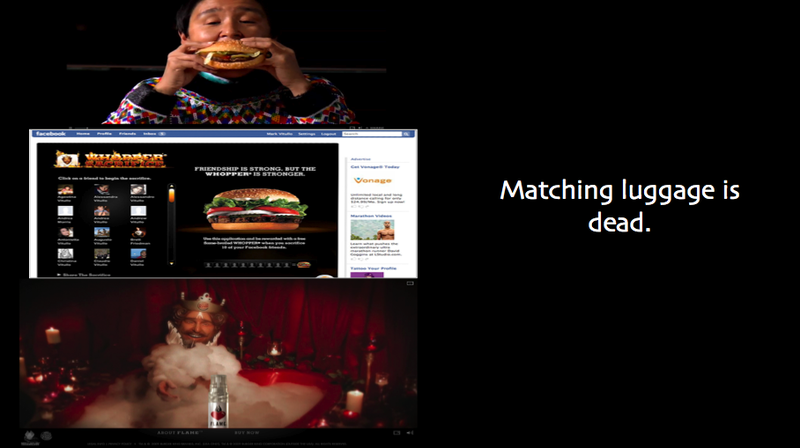 You may have seen Whopper Virgins and Whopper Sacrifice. These came off of the same brief. They were presented among many other ideas – each treated equally. We didn’t present “routes” with TV, print and online springing forth. Instead each idea was a board. Some were more expensive than others, for sure. But together with the client we were able to choose the right mix of experiments to try. Do you remember Whopper Flame? Probably not. It was a real fragrance inspired by the Whopper (though it did NOT smell like Whoppers!). It was available online and in a pop-up store. It just didn’t take off like the other two, but BK was willing to find out if it might. BK doesn’t pretest, and as Les Binet’s (of DDB London) research of IPA papers shows in the UK, brands that don’t pretest see higher effectiveness results than those that do. The real world is the only true test. Making stuff over and over and seeing the results develops your palate as to what will work for a brand. And a brand can have 25 different logos or three different campaign ideas, big or small. People can keep up. More detail is in fact what makes a brand more interesting. The same principle applies to any cultural artifact as Everything Bad is Good For You taught us. Think of TV shows like Lost. There are 30+ characters, we jump from present to past to future to alternate timelines. But no matter. We can track. And we track even better when we discuss with each other. These details matter. So as planners, we should all strive to live by the principle that best ideas win. For planners this means a lot of hard work to free yourself from a few things: talking about big ideas, blowing out a big idea, presenting routes, and concepting toward TV/film content first. These issues are not just for ATL agencies to struggle through; many digital shops share the same difficulties. Instead of writing stories, we’re building scenarios. The communication we’re creating is no longer linear, and it isn’t narrated by one voice. Not everyone will experience it the same way. And thats OK. Instead, we have to understand the landscape, realize that people are coming in from different directions, and direct them where we want to go based on their individual needs. Looking forward to more of this. Thanks Heather. I enjoued reading your blog. I’m Search Associate at Saul&Partners looking for an Account Planner for a very cool independent creative agency in London. Salary: about 30k. Woud you beinterested?If not,do you know anyone who would be? Please let me know, I will send more info.